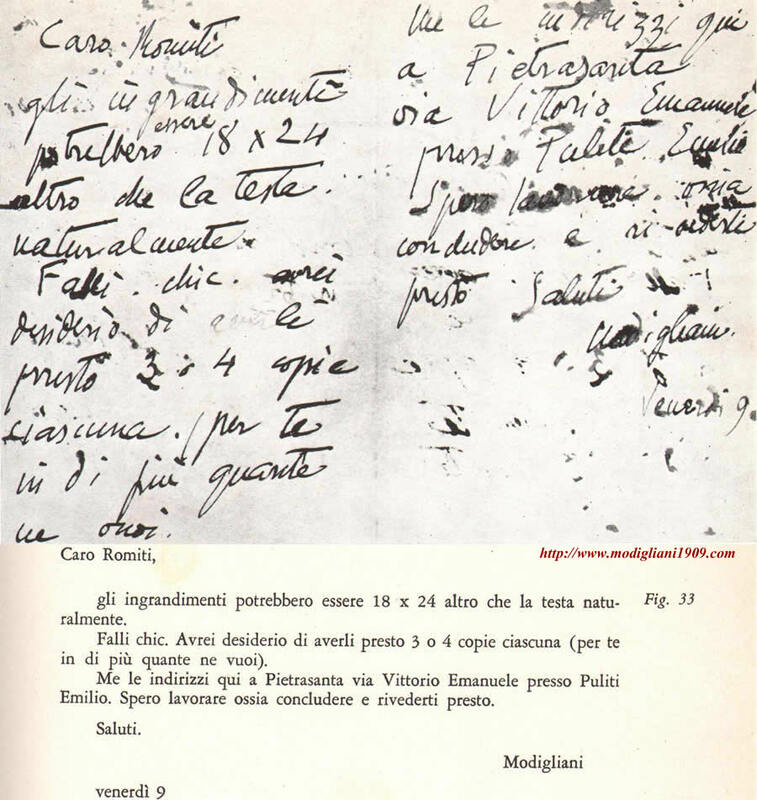 The very limited Modigliani's correspondence, discouraging for the number and quality of surviving documents (especially if we think of the remarkable literary skills of the artist from Livorno and the large number of letters that must have got irremediably lost and that would have illuminated so many dark moments of his journey), show us only one document related to the summer of 1909, spent in Tuscany: it is a letter (known since 1993) sent from Livorno, on September 5, to his friend and patron Paul Alexandre. It speaks, with uncertainty, of the wish to exhibit at the Salon d'Automne the paintings made during this first Italian stay (and that is certainly The Beggar of Livorno, a canvas capable of witnessing the ever-living impact of the Cézanne's fundamental retrospective at the 1907 Salon), of the happiness of returning to Paris, "restored in both physical and sartorial respects" thanks to the loving care of his family, of the emotions for have visited Pisa and the desire to see also Siena, of the postcard received by the painter Henri Le Fauconnier (who lived in rue du Delta 7 and who in 1909 had painted the Portrait of the poet Jean Pierre Jouve, a work capable to charm the artist from Livorno), containing "four absolutely extraordinary lines of nonsense about Brancusi which pleased me [Modigliani] enormously", and of his relationship of great affection towards "that man" (we are still talking, in all likelihood, of Brancusi), asking to Paul Alexandre, although very busy by medical profession, to bring his greetings to the Romanian sculptor. The letter ends with a promise to come back in Paris before the end of the month. 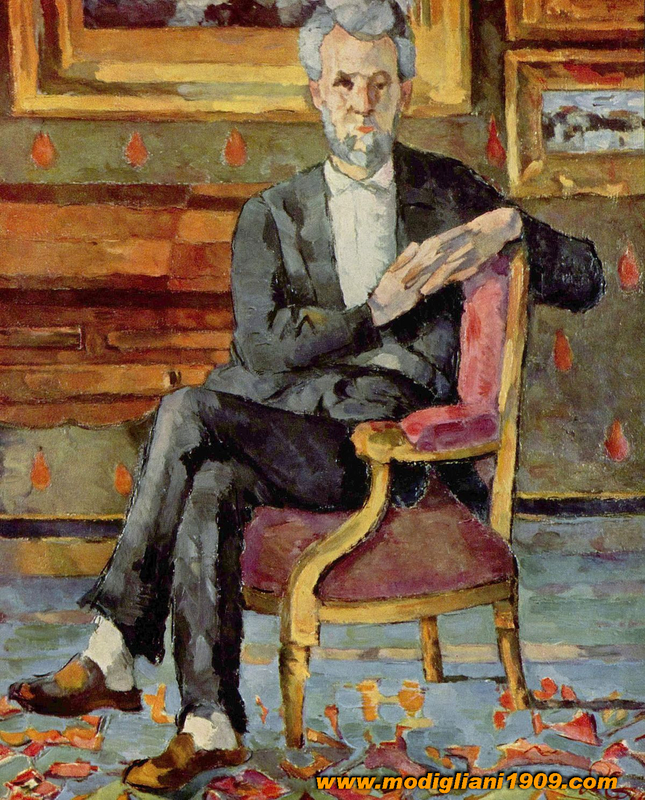 On May 28, 1909 Jean Alexandre, writing to his brother Paul in Vienna to keep him informed about what was happening in Paris and in the circle of the rue du Delta, had announced Modigliani's departure "always with nothing left in his pockets": "fortunately he will spend three months in Italy, July, August and September. It will be good for him under all points of view. All those exhibitions he's visiting, in fact, they are not useful for him if not to increase his instability that you have seen before your departure". 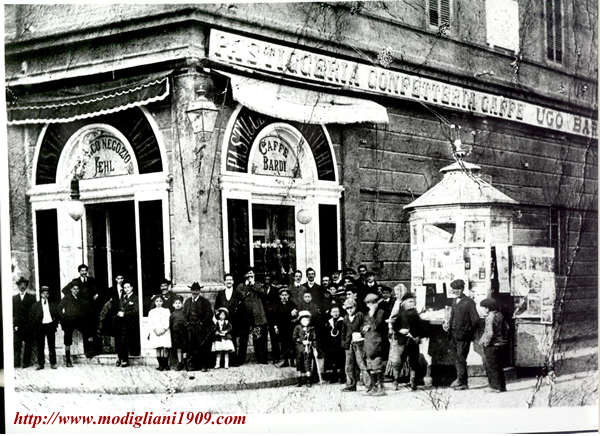 There are no confirmation that Modigliani, in this first stay in Livorno, had re-established particular relationships with his friends of the Caffè Bardi. 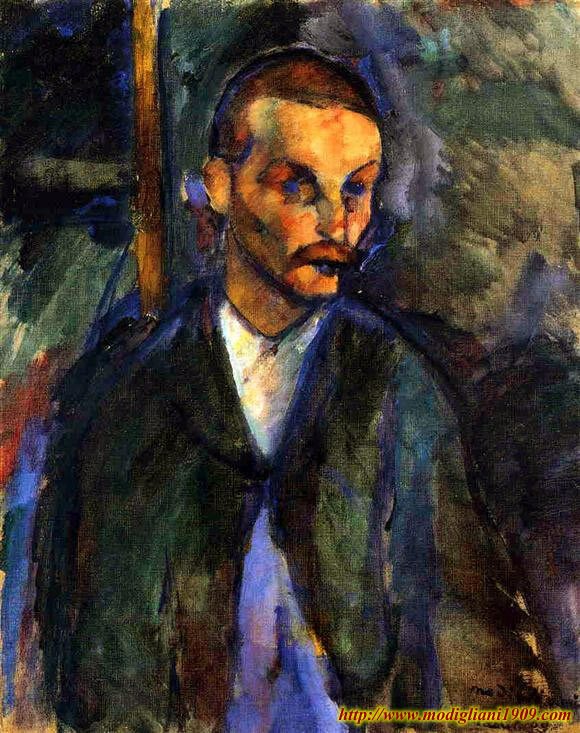 It must be remembered in this regard that they had not moved a step forward in art since he had left them, so from this point of view, they did not have to interest so much the young Modigliani just came back from a city like Paris, the epicenter of the different artistic and cultural trends of the 20th century. 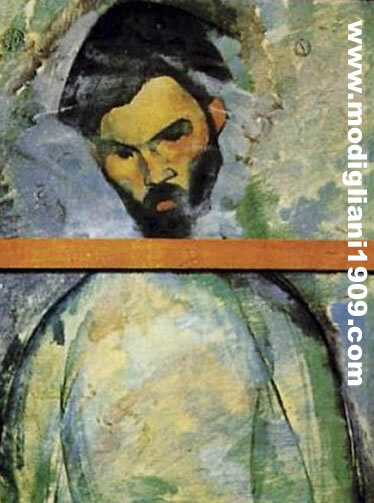 Moreover, the 'Cézannist tradition', that defined Modigliani's painting at that time - just see the Beggar of Livorno painted during the summer 1909 -, didn't find any links in the city of Livorno: only Oscar Ghiglia, but only a few years later and under the influence of a patron such as Gustavo Sforni (who owned a masterpiece by Cézanne in his Florentine collection, the Portrait of Victor Chocquet), will be able to establish a fruitful dialogue with the painting of the Provençal master, but Modigliani will have already left his Cézanne phase and definied, following a period of intense activity as a sculptor ended in 1913, an own autonomous and very original language. 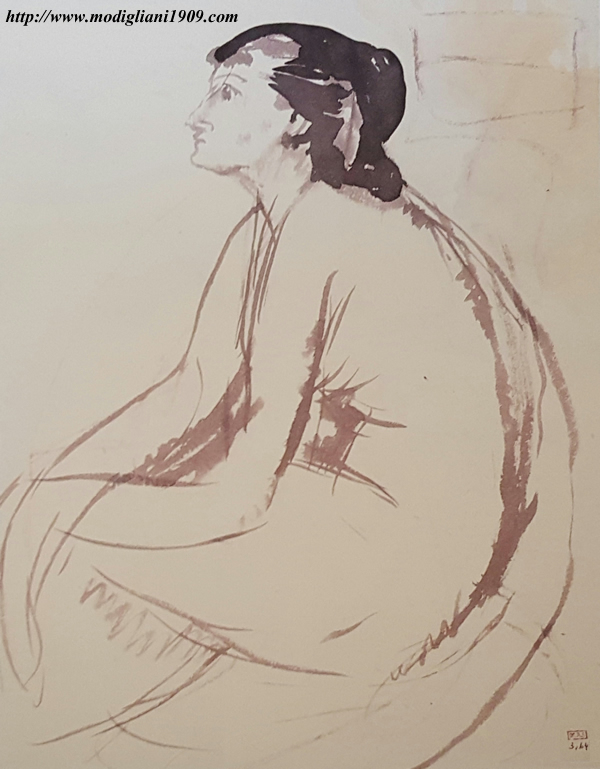 The only other work certainly executed in Livorno, as mentioned by Paul Alexandre (signed by the artist in pencil on the verso of the sheet "first trip in Italy"), is a beautiful female portrait: even in this case it's quite impossible to find any relationship with the themes painted in Livorno at that time; if anything, some connections with the soft and enveloping rhythms of Matisse's painting. 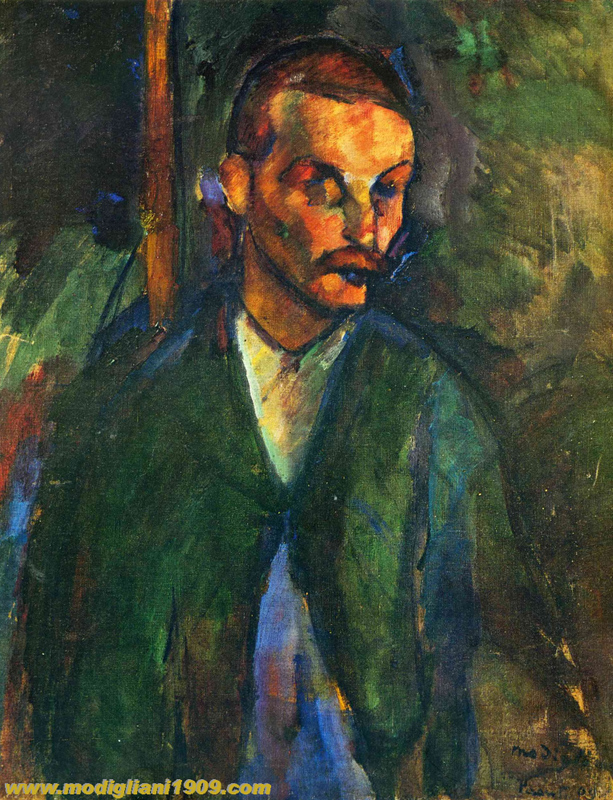 But in the summer of 1909 spent in Livorno, taking into account the memories of Roberto Simoncini (the man portrait in The Beggar of Livorno, the only painting - as we have seen - brought back to Paris) passed down by Piero Carboni, Modigliani must have worked, more than in painting or graphics (and in fact it is surprising that only a painting and a drawing survived for sure in the three Italian months), especially to produce sculptures: he would have carved five heads, his first plastic experiments, three of which fortuitously survived. 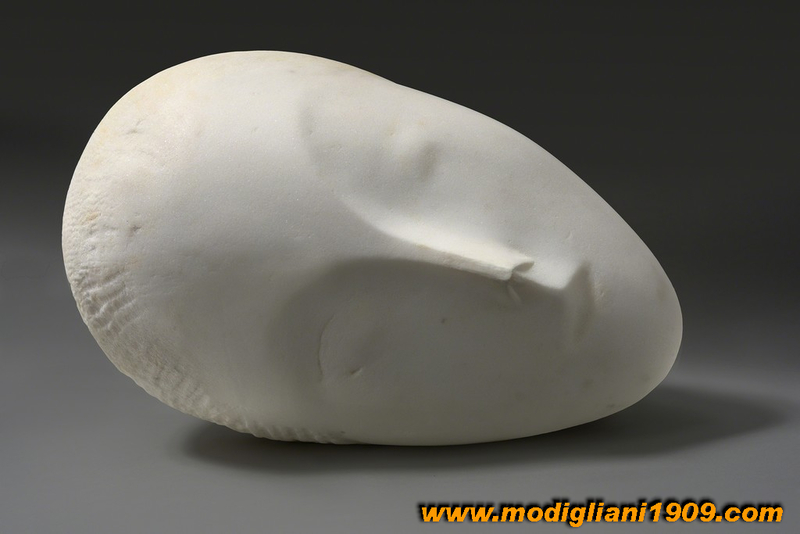 Early works, owever able to delineate the beginnig of Modigliani's sculptor activity, an 25-year-old man still looking of his own artistic autonomy, able therefore to predict only in part the masterpieces that will be carved over the years dedicated exclusively to the sculpture, revealing rather the influence, technical and expressive features of Brancusi works, the Romanian artist known at the beginning of 1908 thanks to Paul Alexandre, and attended with passion and intensity precisely in the months preceding this first stay in Italy (as documented also by the portraits dedicated by Modigliani to the sculptor, or by the beautiful charcoal executed immediately after this stay). 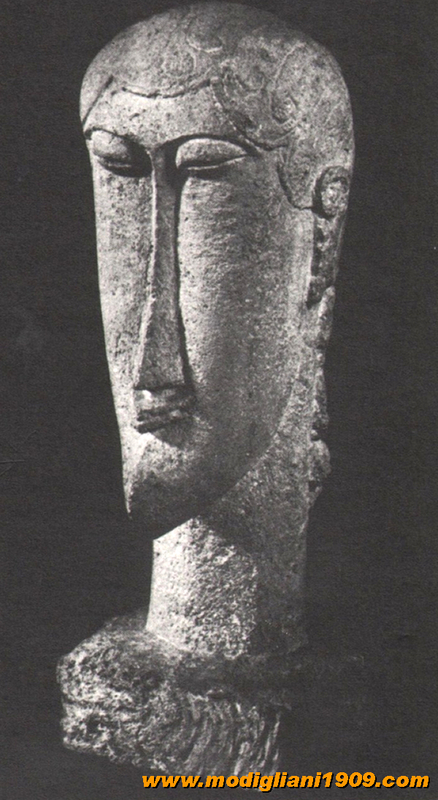 Although Paul Alexandre rightly emphasizes the distance of Brancusi's research from that of Modigliani, the heads carved in Livorno during the summer of 1909 reveals, actually, how in this auroral phase of Modigliani's sculpture, the Brancusi's approach played a crucial and decisive role to led Modigliani in the realization of his first plastic experiments (it is not easy today to evaluate the role of Maurice Drouard for the difficulty to track down his works of that period; while the admiration for the tasteful bronze works by Elie Nadelmann, always testified by Paul Alexandre, is explained by thinking to the artist's admiration for everything that seemed to be oriented towards a "simplification and a purification of form". To understand the first Modigliani's surviving sculpture works carved in Livorno during the summer of 1909, we need to rethink to Brancusi's activity in the immediately preceding two-year period: well, in this period, between the end of 1907 and the first months of 1909, the Romanian sculptor was going through a decisive phase of his stylistic development, burning bridges with the Rodinian tradition and moving towards that purified, neoplatonic language, which will characterize his art in an increasingly innovative way starting from 1910. The surviving works and those dispersed or lost (but anyway documented by the beautiful photos taken by the same sculptor) represents a tangible sign of a genuine moment of a "primitivistic crisis", lived with enthusiasm and passion, that takes shape in so radical and ostentatious results, that it cannot find comparisons in Brancusi's next work: a sort of tabula rasa of all that had been learned in previous years, under the influence of those primitive sources that were gaining popularity in the avant-garde Parisian environments, probably stimulated also by the plastic form of a provocative work such as the "Cowering Figure" (also known as 'The Crouching Figure') by André Derain carved in 1907. If still 'The Torment' (or the Suffering), in the declared homage to the languid sentimentality of Laocoön, reveals a very close bond, even in its fragmentary nature, with the contemporary researches of Rodin (whose studio Brancusi had attended between March and April 1907), ''The Prayer', always of 1907, shows a sharp turn of direction: the research for absolute essentiality in the treatment of volumes and in the renunciation of any external descriptive detail seems, in this case, inspired by those medieval sources to which the [Breton] Gauguin had also drawn on, as if Brancusi, in conceiving this funerary figure, had wanted to inspired himself by the protagonists of a Romanesque wood sculpture. 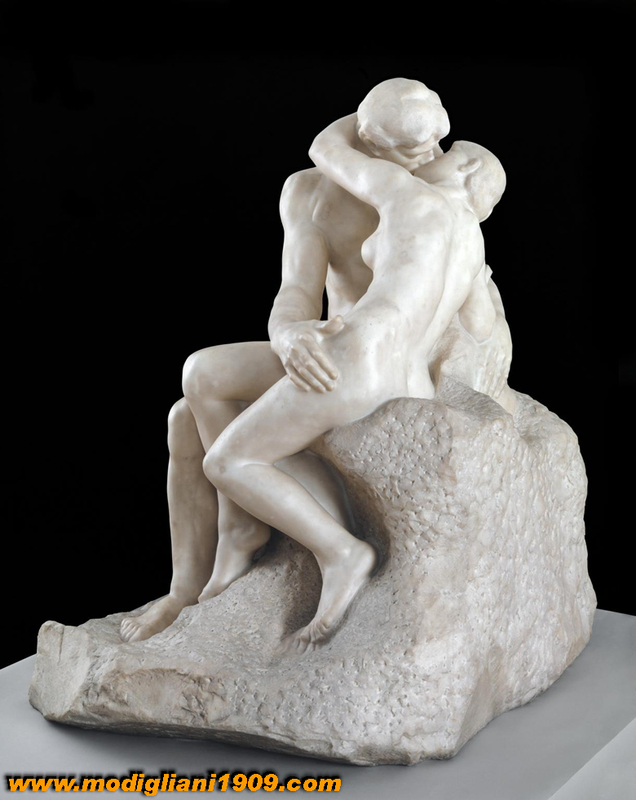 But it will still be 'The Kiss', elaborated between 1907 and 1908 as a veritable polemic declaration of definitive distance from famous 'The Kiss' by Auguste Rodin, to proclaim the quickness with which Brancusi had himself undertaken in this artistic way, looking of more primitive sources capable of regenerating the sculptural art of the twentieth-century: if the technique of direct sculpting of stone and the massive respect, provocative of the cubic form of the block, trace back to the work of Derain mentioned above, the yield geometric, purely linear of the anatomical details seems to find others models: the minimalistic and timeless beauty of Cycladic idols that will fascinate even Modigliani. 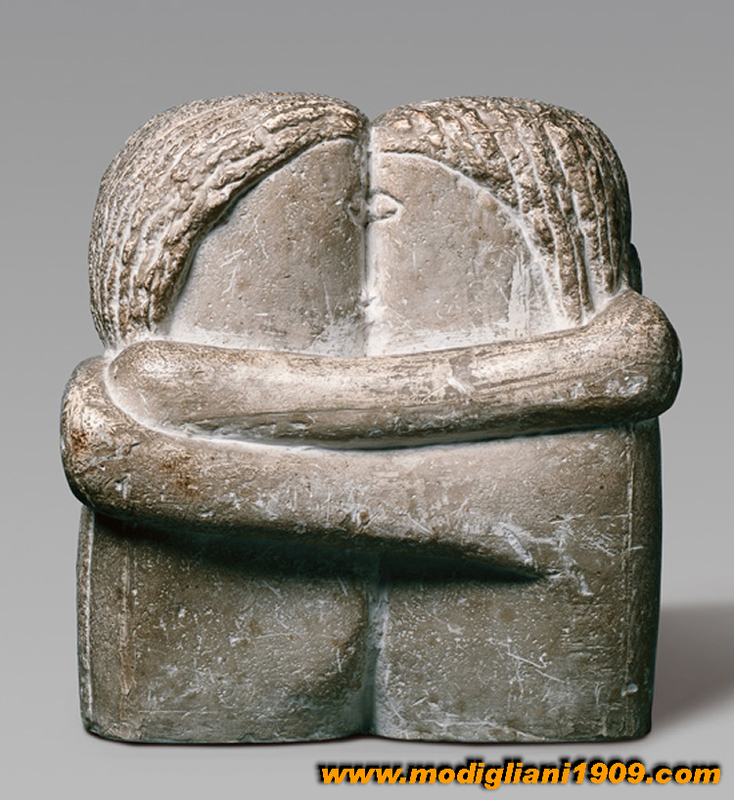 Constantin Brâncuși: "The Kiss, 1907"
Head of young woman, also performed in 1907, probably the first stone sculpture realized with direct carving, inspired by a Fang mask (owned by Derain), where Brancusi appear to be fascinated by the idea of ​​accentuating the "primitive shapes" of African masks: in fact they catch the eye for the exhibited asymmetry of the face, with those facial features that seem almost wounds inflicted on plastic surfaces moved by an absolutely non-naturalistic representations. This path of stylistic regression, in a sort of experiment of the different primitive sources that in those years fascinated the avant-garde artists such as Picasso, Matisse, Epstein, Derain, it culminates the following year in The Wisdom of the Earth (Bucharest, Muzeul National de Art al Romaniei) and in the Ancient Figure (Wisdom), (Chicago, The Art Institute), where the fascination of the Egyptian figures admired at the Louvre meet with a reflection on Gauguin's sculptures studied at the Parisian retrospective of 1906, while the Danaide, also carved in 1908, if in the yield corroded by surfaces, it seems to want to evoke an archaeological find attacked by time and by the elements, it reveals a more refined game of volumes. In 1909 it was performed another work go missing, the Portrait de Femme (La Baronne Renée Frachon), again in competition with the African masks. In this real masterpiece the portrait of Baroness Renée Frachon offers the opportunity for the definition of a face where the clamorous asymmetry of the eyes, defined and blinded by brutal traits, and the rough surface treatment of the hair are in conflict with the definition more elegant, very smooth, of the epidermis surface. 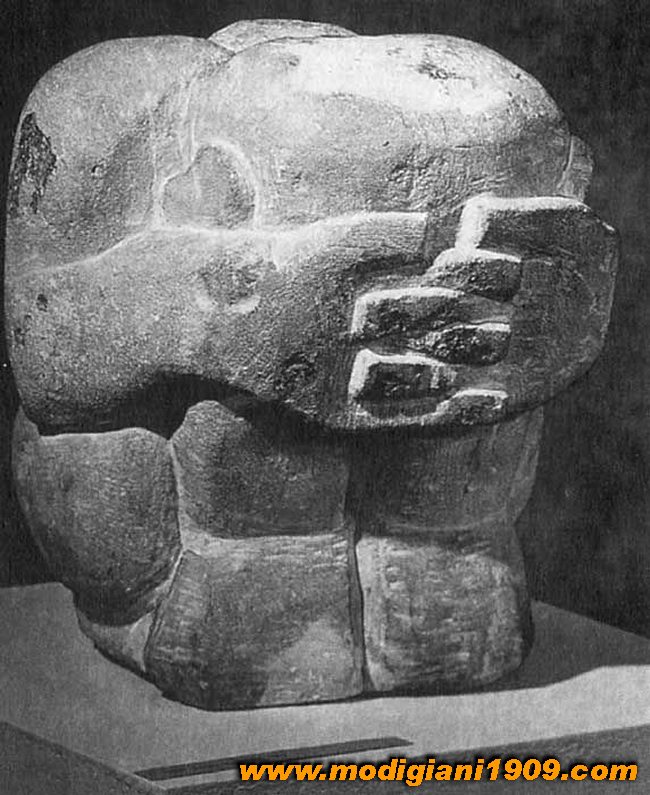 If at this stage of aggressive and experimental primitivism seems to belong also the rough Caryatid that Brancusi will use then as a pedestal for one of his most pure and abstract works (the white marble of the Maiastra carved between 1910 and 1912), is during 1909, probably from the months in which Modigliani moves away from Paris, which begins developing a new phase of the Romanian sculptor's research in a new abrupt change of direction: the Sleeping Muse (1909- 1910) is in fact an invention where the primitivism of the two previous years seems to subside in purified and perfect schemes, as if, after a moment of violent and destructive regression almost at the zero degree of the sculpture, now Brancusi had been struck by a new objective, of producing an abstract and eternal language, in a research that will lead him to fix in defined schemes the archetypes of the forms in definitive schemes. 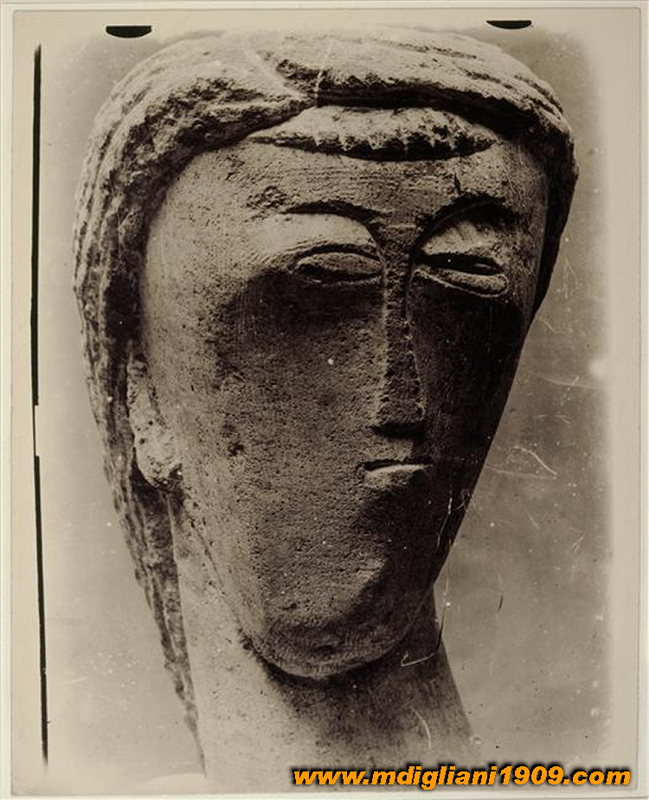 In the course of 1908 and in the first months of 1909, Modigliani, before leaving for Italy, must have shared this dramatic linguistic crisis crossed by his Romanian friend, closely observing his frantic search for primitive figurative sources that also allowed to the sculpture, as had happened in the years immediately preceding the paint, a new beginning. 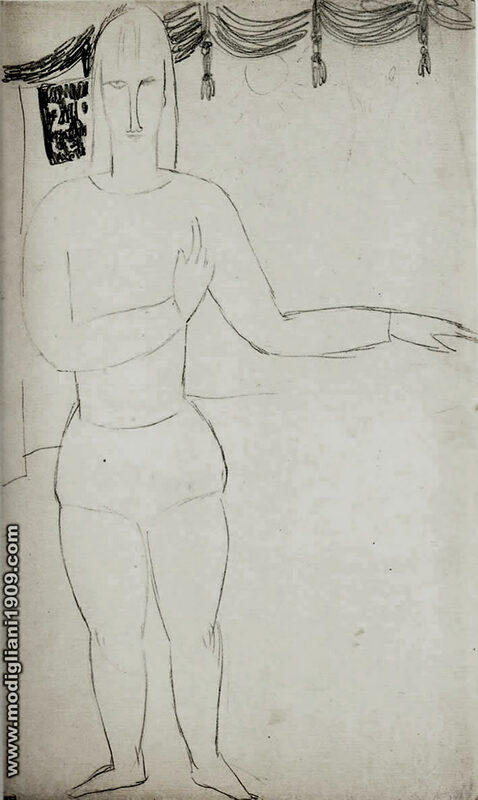 Some drawings belonged to Paul Alexandre and made known only in 1993, confirm that even the artist from Livorno, while continuing his research of 'orthodoxy Cézannism' in the painting, he has shared the reasons of 'Brancusi's primitivistic crisis': just see, for example, a theatrical drawing datable probably around 1908, portraying 'Circus character at the parade, on a background of drapes with tassels', clumsy like a childish sketch (such as to almost presage Carrà's famous works of 1916), but with a face where some stylizations already appear that will become typical, a few years later, of the 'classic' sculptures by Modigliani; or the Caryatid (sanguine drawing) almost certainly from 1908 (Woman dressed with a loincloth that walks with an object on her head), where the geometric schematization of the body with plastic quality, contrasts with the purely linear definition of the face, created as a comparable primitive mask, for the purely linear definition of the somatic traits, with the head of The Wisdom of the earth by Brancusi. 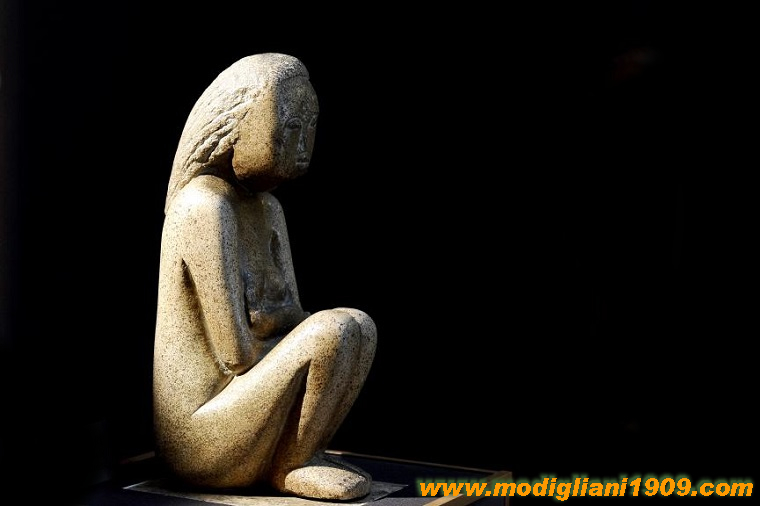 Going back to talking about Livorno's heads, it must to be remembered that the name of Modigliani was completely unknown in Livorno, so much so that the artist's death passed completely unnoticed among the "friends" of the Caffè Bardi, such as in Livorno in general, where no tribute was conferred on him, and things did not change even in the following years, just think to the flop of the exhibition, albeit modest, set up at Villa Maria in 1984 for the centenary of the Modigliani's birth. 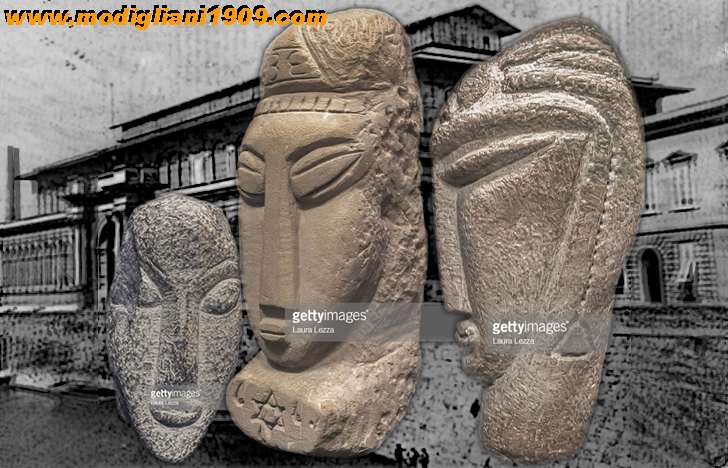 So it is difficult to have the suspect that the three heads shown by Solicchio to Piero Carboni in 1932 were realized in "Modiglianis manner" by an anonymous sculptor from Livorno, or as a tribute to the rediscovered greatness of the artist, and it is also very hard not to ask ourself this question: who would have carved, on any work, in that historical period, a symbol like the Star of David? 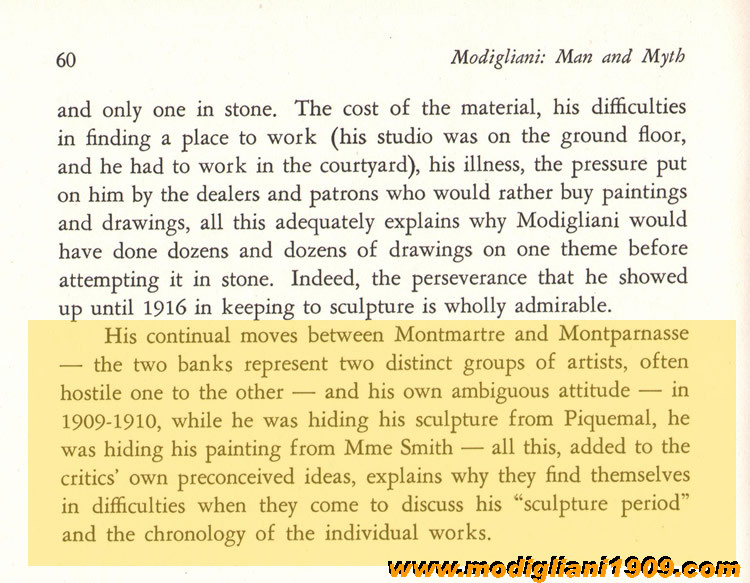 Another thing to keep in mind is the fact that an eventual forger would never have dated the sculptures 1909, that's because the volumes written by the Livorno authors, to which we must also add Jeanne Modigliani, did not speak of a Modigliani sculptor in his hometown in 1909, but during his last trip in Italy, so the hypothetical forger would have made a mistake (clumsily) in the dating, given that the aforementioned authors talked about Modigliani in Livorno between 1915 and 1916. 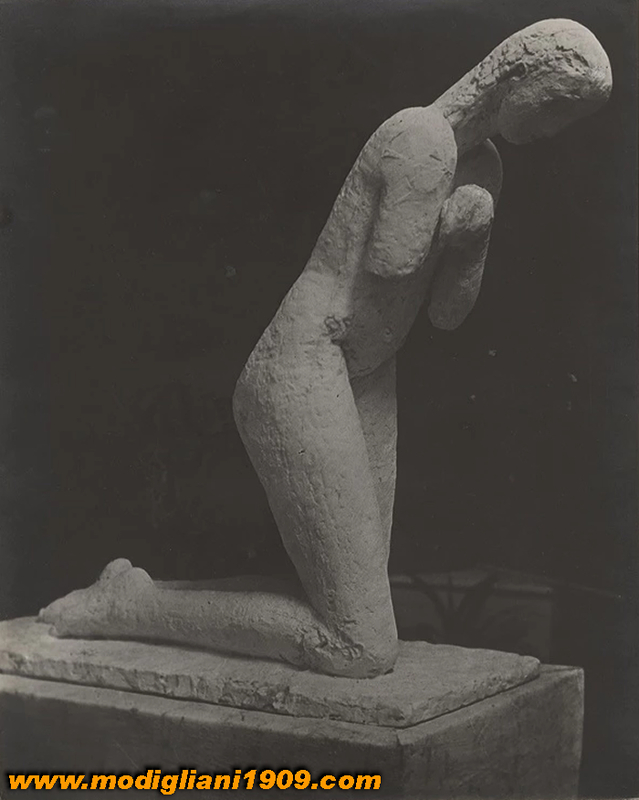 It is important in this regard to recall that the last artist's stay in Livorno took place in 1913, information the latter that we know only since 1993 (therefore two years after that Carboni's sculptures were made known to the press), thanks to the documents published in the catalog of the Venetian exhibition of the Collection of Paul Alexandre. But beyond the very limited possibility of a hypothetical counterfeiting (why the owner, a simple and modest fruit and vegetables vendor, would have made them realize and then kept hidden for years? 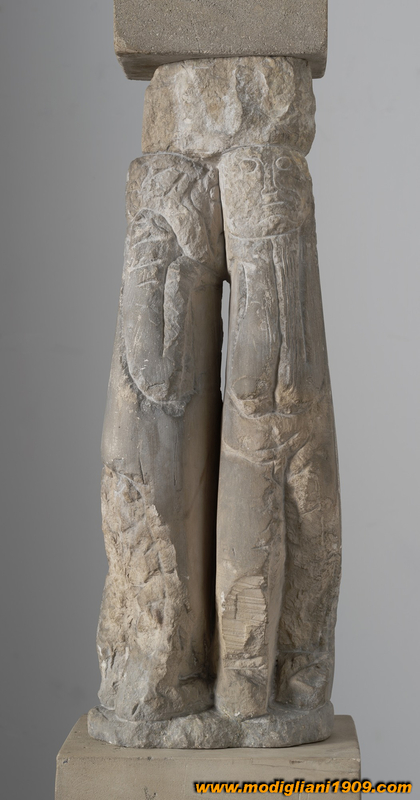 ), it seems to me that it is really a formal analysis, dispassionate and as objective as possible, on the three sculptures to remove any doubts about this affair. 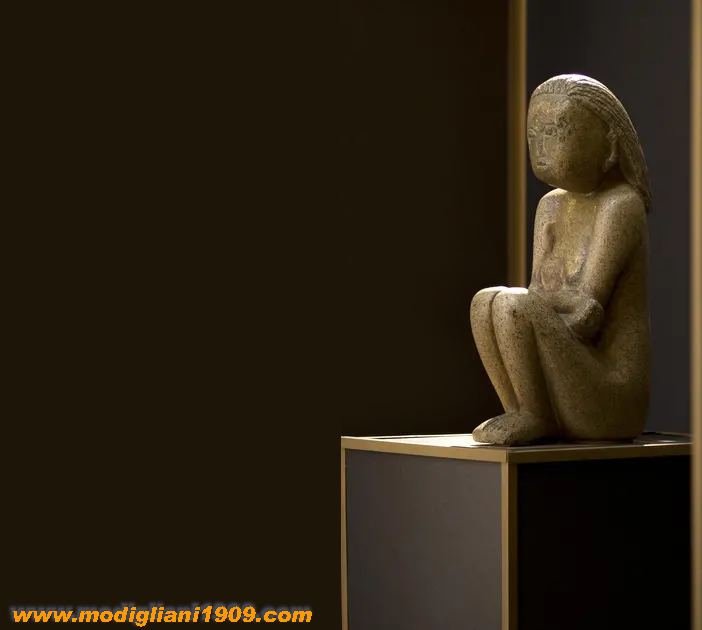 From an artist dedicated to creating tributes to Modigliani's sculptures, and even more from a forger committed to producing works with the intention of deceiving an eventual collector, one would have expected a result very close, technically and stylistically, to the more masterpieces famous and accredited by the artist (and in particular on a date, around 1930, when the sculpture of Modigliani was absolutely unknown in Livorno). Furthermore, a forger would never do something of atypical compared to the style of the artist he intends to forge, for example the noses of the sculptures recognized as authentic (and fakes too), have the same characteristic of the shape of the nose (triangular) like in the drawings of caryatid, while in the three heads saved by Piero Carboni have half hexagonal nose like a drawing, exhibit for the first time in 1993 in the Venice exhibition, ably recognized by Carlo Pepi at the inauguration, together with two other works whose analogies with the sculptures appear more than justified. Regarding the three Livornese heads, compared with the well-known and documented works, they remain in the state of announcement: I mean, to think that a brilliant and precocious forger of Modigliani has been raised the issue of reconstructing an hypothetical prehistoric sculptor activity of the artist at the date 1909, it seems extremely implausible, almost impossible. 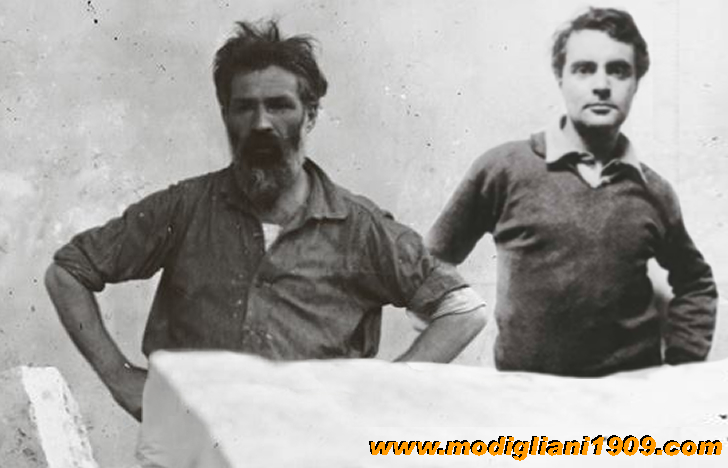 The problem of the Modigliani fakes must be faced without fear or reticences: the evidence and the testimonies gathered in the years confirm that the three heads were sighted for the first time in Livorno in 1932, and it is therefore very difficult to assume they could have been produced by a skilled and early counterfeiter of Modigliani's sculptures. 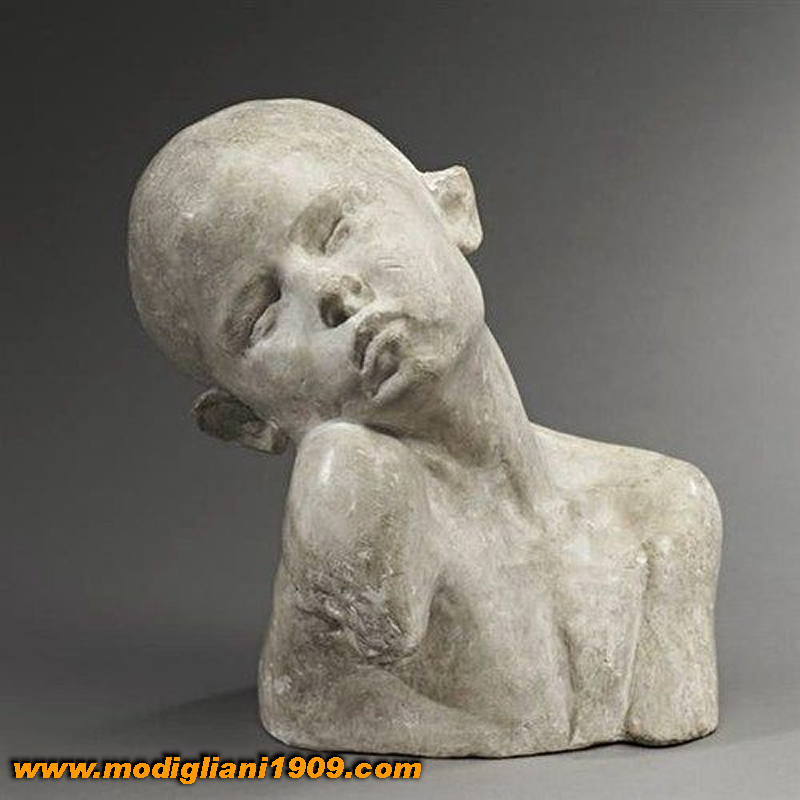 The artist from Livorno was very forged over the years, particularly as a painter, already after his death and the first commercial launch of his works, but in the following decades also as a drawer and sculptor. An exemplary case of a fake (?) 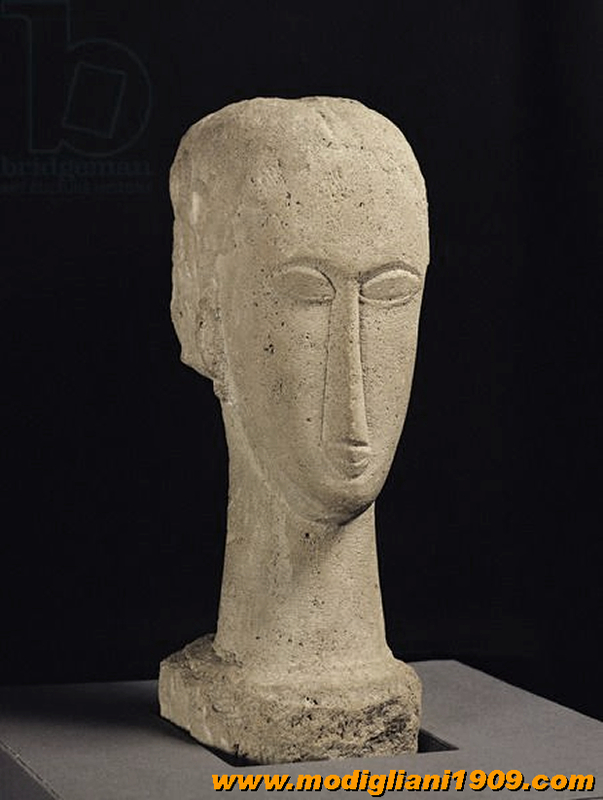 sculpture by Modigliani capable of misleading the experts until recently it was been, for example, it is the "Head (Ceroni XVIII)" (1911-12) in a private Paris collection included in Ceroni's catalogue, also accepted in the recent Rovereto exhibition and indicated as a forgery by Flavio Fergonzi only in 2013, or the "Head Ceroni XIV", immediately declared fake by Carlo Pepi when it was exposed during the exhibition in Livorno in 1984. 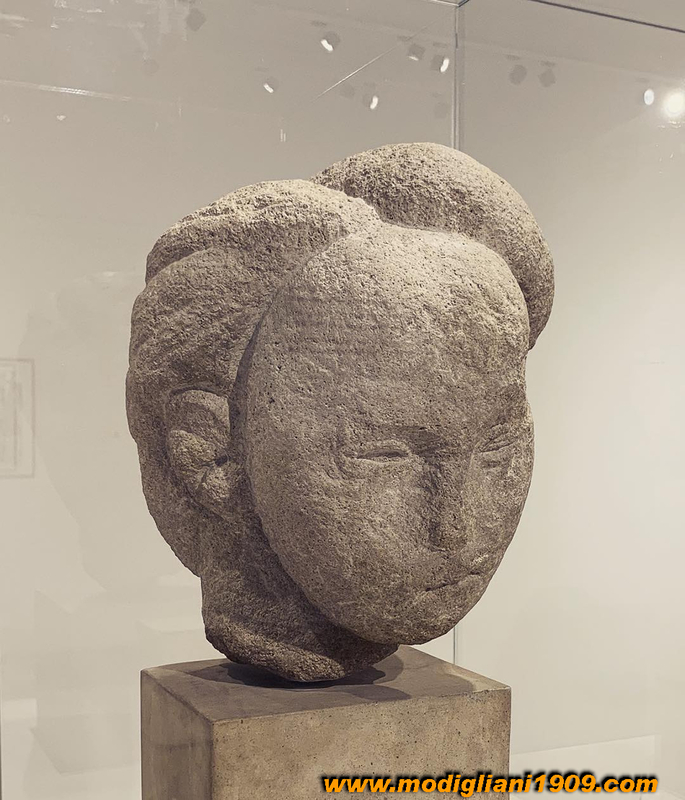 In the same exhibition, Pepi had also expressed doubts about the authenticity of the Portrait of Picasso whose provenance is the same as the aforementioned sculpture. 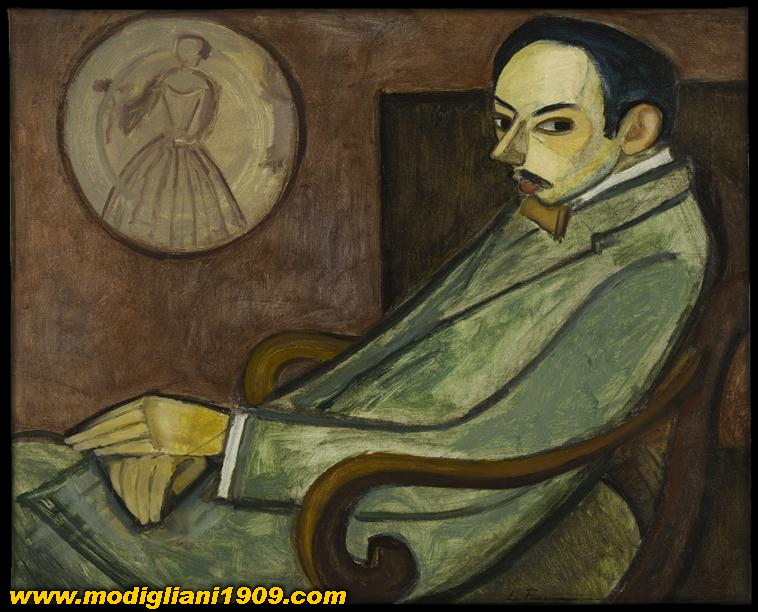 Carlo Pepi is a Modigliani specialist and collector of Italian art of the nineteenth and twentieth centuries. 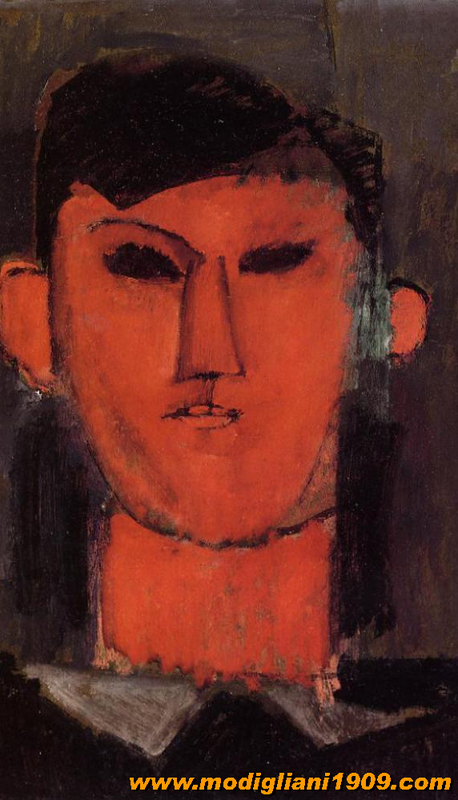 As such he is convinced beyond any doubt of the belongs of the three heads to Modigliani. Not for the first time dr. Pepi reacts against forgeries that result in the impoverishment of the national artistic heritage and in the caos, often for low mercantile purposes, with regard to the works of many artists (Modigliani is one of the most copied artists in the world). If Carlo Pepi has authenticated the three sculptures it is a fact that cannot be ignored, at least for those who are aware of his history and the battles he has fought (battles that he have always won), and fortunately he still fight also today, against this never-ending proliferation of fake works, expecially in Italy. In addition, Pepi has shown considerable courage and competence for having authenticated those sculptures in 1991. 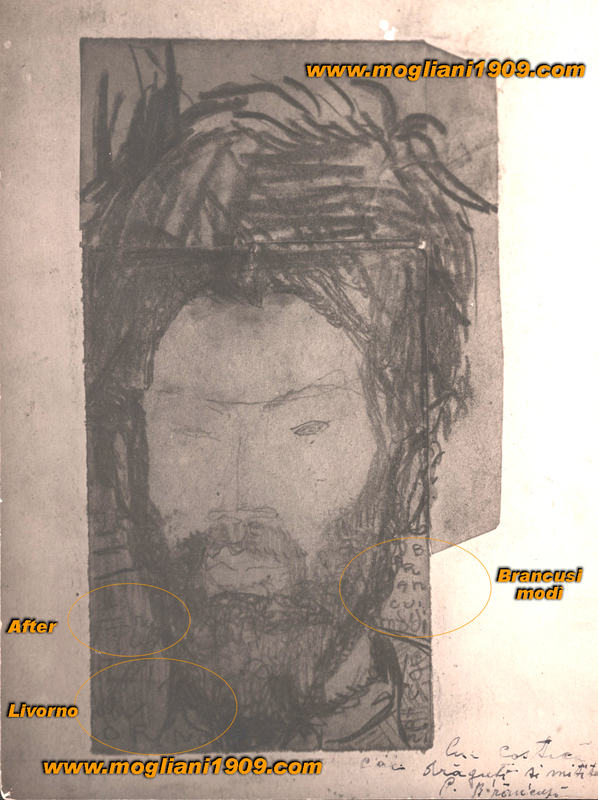 First of all because the testimonies and the proofs, including the writing of Modigliani on a book saved with the heads came to light after that time, but also because the evidence (historical and artistics) to prove what Piero Carboni told, they arrived in 1993 with the Venice exhibition. Three famous art historian such as Wayne Vesti Andersen whose credentials are simply impressive, James Beck and Enzo Carli, had supported Pepi's judgment. 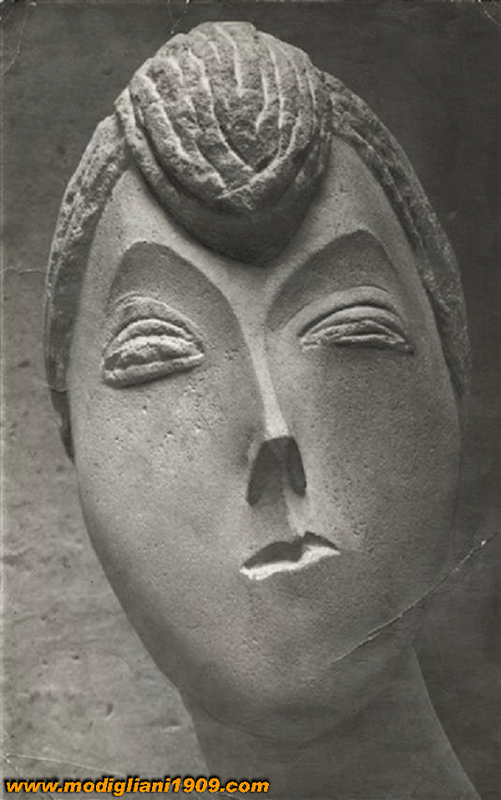 Everything leads us to think of finding ourselves in front of precious relics, fortuitously surviving, of an auroral phase of the artist's sculptural activity, attempted as an experiment in the long Livornese summer of 1909 under the influence of the Brancusi works realized in the months preceding the Modigliani presence in Paris: an experimental phase, in which the artist, after the interest shown for the sculpture already in 1902 (just see the letter to Romiti sent by Pietrasanta), he would have finally dared, still substantially like a neophyte, take hammer and chisel and attack the stone block; a phase that was soon overcome, after a temporary return to painting in view of the 1910 Salon des Independants, in the series of works, ever more masterly, performed in the two-year period 1911-1912. Therefore, early works, still far from some masterpieces realized in the following years (we bear in mind that the datings of the sculptures turn out to be incorrect), but in any case extraordinarily interesting works for reconstructing the "prehistory" of one of the most original sculptors of the twentieth century.